Bees can become addicted to pesticide-laced foods the same way that humans become hooked on nicotine, according to a new study. Agricultural pesticides, particularly neonicotinoids -- a class of neuro-active insecticides chemically similar to nicotine -- have long been believed to be detrimental to bee populations, affecting their ability to reproduce, limiting lifespans and other potential consequences of exposure to pesticide-laced foods. But the new study, published in the British scientific journal The Proceedings of the Royal Society B, suggest that bees can get hooked on neonicotinoids-laced foods. 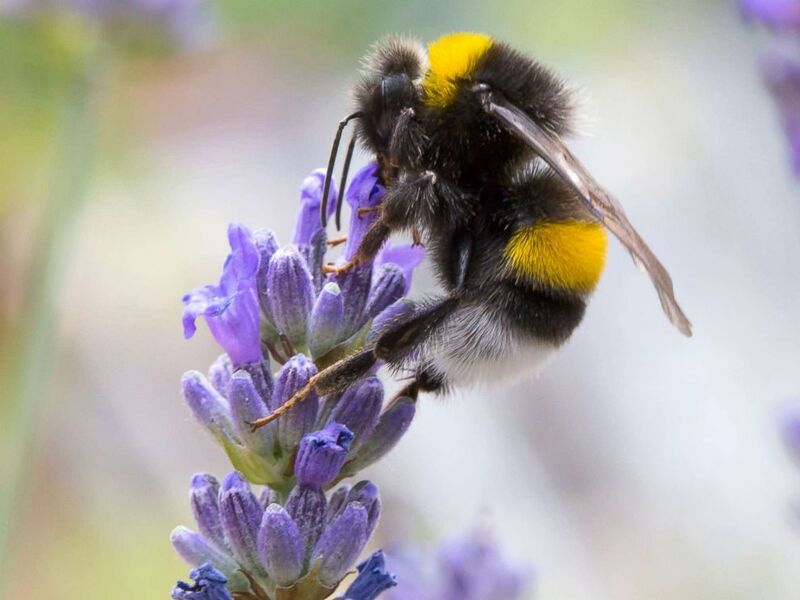 “We originally wanted to know if the bees could detect the presence of this class of pesticide and, if given enough time, learn to avoid food containing the pesticide,” Richard Gill from the Department of Life Sciences at Imperial College in London told ABC News. “In mammals, for example, we know that nicotine is an addictive property, so we could make that inference that maybe these neonicotinoids -- considering they act on similar targets -- may have similar addictive properties,” said Gill, who led and supervised the research team. Neonicotinoids target nerve receptors in insects that are similar to the human receptors that nicotine binds to, according to the 18-month study, which was conducted by a group of six researchers and scientists. 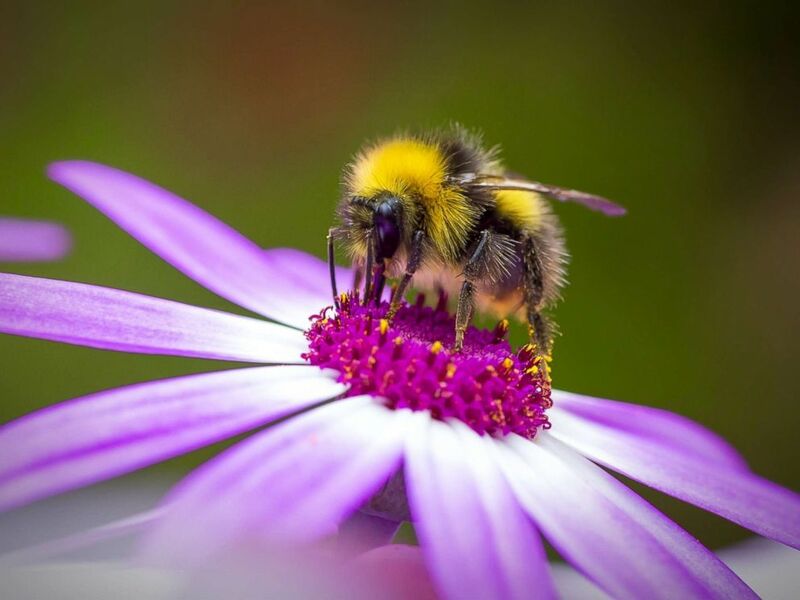 A bumblebee gathers pollen from a flower in this undated stock photo. The researchers placed individual colonies of bumblebees in arenas in a laboratory -- which allowed individual bees to leave the colony and fly within the arena to find the food that was left out for them, according to Andres Arce, one of the team members. In mammals, for example, we know that nicotine is an addictive property, so we could make that inference that maybe these neonicotinoids -- considering they act on similar targets -- may have similar addictive properties. And our behavioral experiments suggest that that might be the case. During the research, the group provided the bees with three different types of food containing either no pesticide, a low amount of the neonicotinoid pesticide, or a higher amount, said Arce. For 10 days, the group monitored the behavior of the bees toward the food provided and how much of each type of food was eaten. They also counted the number of times the bees visited each type of food and the amount of food they consumed, Arce said. The researchers also changed the position of the feeders, which were identical, halfway through the experiment, to see if the bees tracked their preferred treatment. “At the start of the experiment we saw that the bees preferred the food containing no pesticide, with the pesticide-treated food visited and consumed less than the pesticide-free food,” Arce said. By showing this change over time, the group demonstrated that the bees were developing a preference for the pesticide treated food. “We also saw that when the position of the feeders was changed, the bees responded and would still visit the feeders containing the pesticides –- which indicates that they could detect the pesticide and would track it,” Arce said. The researchers hope that their findings will help to foster more responsible use of pesticides. Earlier this month, California's Department of Pesticide Regulation released a report which concluded that neonicotinoids cause a significant risk to the bee populations that are brought in to pollinate crops in the state's $45 billion agricultural industry, according to the Los Angeles Times. “The more we learn about the toxicity of neonics, the more apparent it is that pretty much any plant with nectar or pollen sprayed with these poisons is unsafe for bees,” Nathan Donley, a senior scientist with the Center for Biological Diversity, told the newspaper, using a common shorthand term for neonicotinoids.